Standing in the middle of the north side of the cemetery is the restored red sandstone grave marker of the oldest known interment in our cemetery. Thanks to Tom Metcalf, current cemetery grounds supervisor and stone restorer, the fragile pieces of this stone were skilfully placed together, fixed in concrete and set upright on a base to identify the final resting place of David B. Clem, son of James Clem, who died 27 Oct 1848, aged 20 years. There were probably earlier unmarked burials. 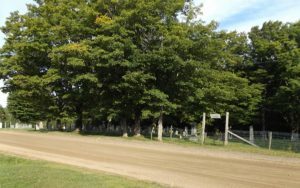 The cemetery is divided into 2 parts; the oldest interments were on the north side of the road. It was likely that families looked to the south side of the road as the north side became crowded. 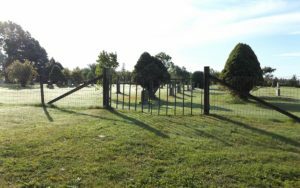 Respected local genealogist, researcher and Chipman Brook resident Garnet Misner, who has studied extensively the original land grants and early land transactions in our area, believes that it was Henry Hall who donated the cemetery land, a small piece of his huge property in 1849. This was in conjunction with an adjacent parcel 62 ft. by 80 ft. on the northwest corner of Barley St. and Hamilton Rd intersection where a “Christian Meeting House” known as Bethel was built. A copy of the Lease Henry Hall to Trustees of Christian Meeting House (27 Oct 1849), outlined the terms and land description. Lifelong community resident Myrna (Ogilvie) Saunders recalled that there was no cremation or embalming years ago; a glass was put over the top of the coffin. This was to detect any moisture so as to ensure that the person was really dead. ‘You did them up yourself-you bathed them and you dressed them. They stayed at home in your parlour for 2-3 days; you had a wake while the family kept watch.’ Myrna recalled when her grandfather, Abe (Abram Ogilvie), was laid out in his parlour and attending the wake as a little girl. She and her older sister were allowed to see him. Another well -known early community resident, Margaret Swindell, related the first time that she saw a funeral hearse; it was being pulled by a team of black horses coming up the Hamilton Rd. from Harbourville. It was the funeral for Mrs. (Gould) Lee, Esther Ogilvie’s mother, who lived on the Shore Rd. and had frozen to death. Margaret’s mother played the organ at the funeral; Warren Cahill took her to the church in a horse and sleigh. In the late 1950’s, the neglected cemetery became overgrown with shrubbery. Warren Swindell related that John Bezanson of Garland took on the volunteer task of making improvements to the cemetery and hired Brint Grant and then the Clements brothers to mow the grass. Lloyd Daniels and his son, Lorimer, continued to hand dig the graves. John and Warren then approached Leslie Saunders for assistance; Les had a small ride on tractor and faithfully mowed the cemetery for many years to come. Myrna, his wife, often helped with the trimming. When John became too elderly to continue managing the cemetery, his son, Bill, took over. Bill and his wife, Alice, kept a hard covered book containing handwritten entries which chronicled donations to the cemetery circa 1980, as well as a plot map of the cemetery. A newspaper clipping from the Berwick Register in 1979 included in this book identified the cemetery committee members as: Edward Sweeney, Malcolm Ogilvie, Warren Swindell, John Bezanson, Alice and William Bezanson, Sect. Treasury. This dynamic society has accomplished a great deal in a short time: a comprehensive plot plan and a list of all stones and their inscriptions, charitable donation status with Revenue Canada, plot fee of $250 for the right to be buried implemented, regular grounds mowing and care, ongoing stone repair, annual Spring cemetery ‘Clean Up’ night, maintenance of an active website , purchase of a land adjacent to the cemetery on the north side of Barley St. where a portion has been dedicated to the establishment of a Green Burial Grounds and lastly, the ‘Theresa fund’ and resulting memorial cairn honouring Theresa McAuley Robinson & all abused women.